The trustees received a generous offer from Mark Wickstead, a former colleague of Ian Bensted’s in Thames Water, to spend six weeks with the project in the field in order to advise on a strategy for sustainability. Mark began work in early October and has now returned to the UK, and has prepared a report and recommendations, which the trustees are now digesting to understand how it should inform future strategy. The study extended across both Districts, and liaison was undertaken with both District Water Officers. Mark worked closely with the team, in particular Marius, our Sustainability Coordinator, and with Charles, our man in Kanungu. Members of the Software Team also joined in the study to undertake consumer interviews at tapstands and springs. The study takes in our three main categories of schemes: gravity flow, institutional and individual springs. The Ugandan national database confirms that there are around 2,400 of the latter, many of which are still in use, built by WaterAid/WATSAN since the mid 1980s. Mark organised a team workshop at the end of his tour to review his findings and discuss the way forward. It is evident from Marius’ and Charles’ previous valuable work, mainly on the dozen or so gravity flow schemes (well over 200 tapstands), and from early inspections during this present study, that mostly minor problems develop progressively, without necessarily affecting basic functionality for some time. Taps are frequent culprits! Flow reduction at springs, lack of basic care and attention at tapstands and springs, minor faults in supporting structures, and so on, abound. It is already clear that the database that is being developed, founded on the national database, will be invaluable in providing for action planning in terms of both absolute justification and prioritisation, and plenty of work will ensue. 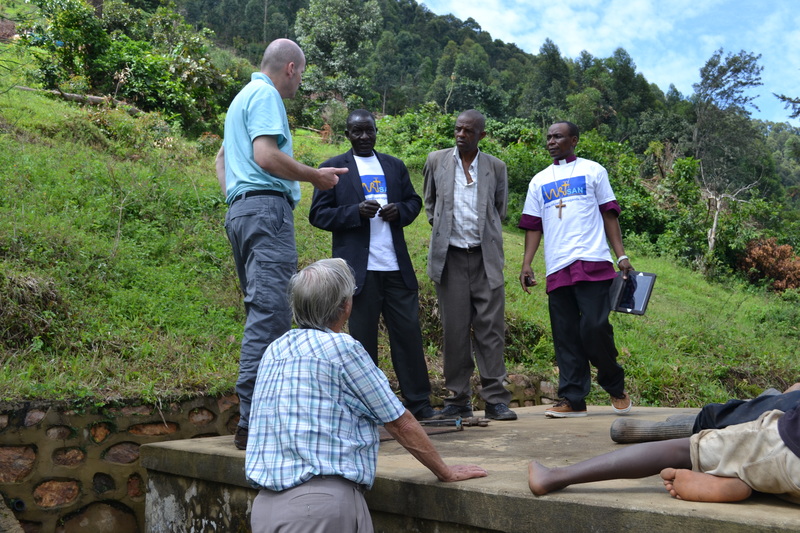 Ian Bensted, Chair of the UK Support Group, accompanied Mark to the project to introduce him to the team, and remained for 10 days. He took the opportunity to visit current projects at Nyakabungo and Kiringa, and to visit and review future plans for Kinyasano Girls’ High School and the three Compassion International Child Development Centres. He found the team in good heart and very busy. It was good the see the Field Director and his team working well together, and continuing to produce high-quality results in both the software and hardware areas. However, the maintenance and sustainability of schemes already completed is a constant battle, and it is clear that the appointment just over a year ago of a Sustainability Coordinator, as well as the study now undertaken, will prove of considerable importance in WATSAN’s future programmes of work. As if to emphasise the significance of sustainability of our projects, shortly after Mark and Ian arrived there was a serious accident on the road between Rukungiri and Kanungu at a place called Kiruruma, where a bridge collapsed under a lorry loaded with timber, also with people riding on top, and the lorry ended up in the river below. 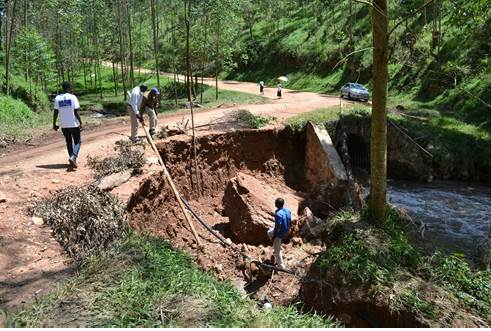 There were sadly fatalities and serious injuries, but the accident also severed two of the main pipelines serving our Nyambizi gravity flow scheme, leaving more than 4,000 beneficiaries without water at its 36 tapstands. The WATSAN Team were mobilised rapidly and have restored the lines, and the UK Support Team made available a sum of £1,200 to meet the immediate costs of new pipes and labour at the bridge, and at two other places where repairs to the pipeline were also needed, due to disruption by the highway authority whilst widening a road, and naturally occurring embankment slippage at another site.